In 2008, local officials raided a cult ranch in Texas and removed all the children putting them into protective custody because of reports of abuse and underage marriages. 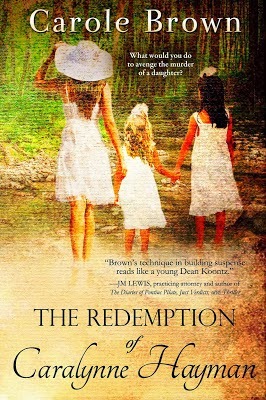 The Redemption of Caralynne Hayman by Carole Brown brought to mind all those news reports as the Texas story unfolded. Brown's story is fiction but glimpses what a cult of that sort might look like from the inside. for marriage. When Cara's abusive husband has a heart attack, instead of giving him his medicine she allows him to die. Enter Dayne, the new minister who was sent to seminary only to return with a new perspective on what the Bible really teaches. Dayne was Cara's first and only love. Together they try to change the cult's ideals and rules but each approaches it from different directions. Cara seeks revenge. Dayne seeks salvation. This is a suspenseful read--a page turner. It's a sensitive topic handled well by Brown, one that could make your travel time pass by quickly.